I am participating in the FREE Harry Potter The Complete Series giveaway event hosted by Mom Powered Media! One super lucky reader will win a BluRay boxed set of Harry Potter 1-7! 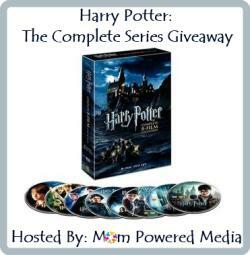 Prize: Harry Potter The Complete Series on BluRay. The event dates: September 19– October 13. Yeah. I'm a huge HP fan. And though I don't have a blu-ray player my parents do and if I win they can have their own set and now borrow mine any more.